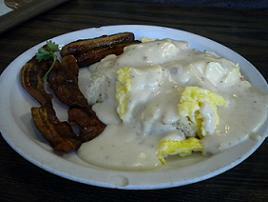 Roady’s is an old-fashioned diner in downtown San Dimas. It was introduced to me years ago by reader Gene Harvey and I’ve gone back a half-dozen times since then. I even had a birthday lunch there with friends a couple of years ago. This time I invited blogger Mike Tanner of the Dinerwood site to meet me there. I’d never met him, but I like his stuff and he’s proved he’s willing to drive out here, producing reviews of Flo’s, Brandon’s, Red Hill Coffee Shop, Stevie Dee’s, Joanne’s Cafe, Corky’s, Mission Family Restaurant and maybe even a few other local staples among his usual L.A. fare. He was game and we met at Roady’s last weekend. I asked Mike his definition of a diner. “First off, It has to have a counter,” he told me. It ought to have breakfast all day, or at least through lunchtime. It ought to have pie. Whether newfangled or original, the diner ought to have a certain diner vibe. And there can’t be any seafood, Tanner said, unless it’s fried, or unless it’s on the menu but no one orders it. Roady’s meets all his definitions. There’s a counter when you walk in, and a pie case. Breakfast is served all day. With the comfortable booths, giant windows, wood paneling, experienced waitresses and American Indian art, the vibe is near-perfect. As for fish, I wasn’t paying close attention, but I’m pretty sure no fish escapes the kitchen unbattered. 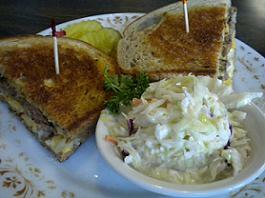 I ordered a patty melt ($6.85) with cole slaw as my side. The vinegary slaw was above average, the sandwich superior as well: burger, rye, grilled onions, cheese, pickles on the side. Mike had the chuck wagon breakfast ($6.45), two biscuits atop two scrambled eggs, gravy on top and, riding shotgun, two pieces of bacon and two sausage links. He liked it. For the day’s pie selection, Roady’s had apple, cherry and lemon meringue pie. 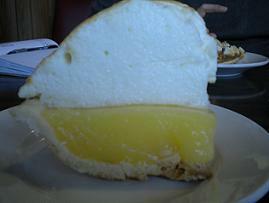 Mike had a slice of apple and I had lemon meringue ($3.45 each). Darn good pie. It was a hearty lunch, a chance to exchange views with another blogger, make a new friend and, for a few moments, share the self-consciousness that comes with snapping photos of your food. If you dote on diners, Roady’s is a must. And so is Dinerwood. Here’s Mike’s piece on Roady’s; we timed our reviews to coincide. Synergy and pie? Wow. Excellent definition of a diner. Excellent lunch order — I love a restaurant that does the basics well and you can’t get more basic than patty melt, slaw and pie. I’m hoping other readers can provide some historical background. 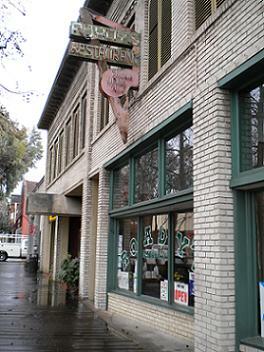 I remember eating occasionally at a restaurant/cafe in this same location as a kid in the ’50s with my dad when we drove on the weekend to his office on the old Cal Poly Voorhis campus. Have you been to Pie and Burger in Pasadena — best ever!!!! Pie n’ Burger in Pasadena is actually one of my favorite places to go for breakfast and pie. I actually proposed to #1 Diner Companion Antoinette there. David, your comments (and also Mike’s) are right on the nose, as far as I’m concerned. When I first told you about Roady’s, I thought it might be pushing the limits on how far you can/will travel for lunch, but I’m happy you manage to go there now and then. Come to think of it, Judy and I have seen you there once or twice, haven’t we. I thoroughly agree with what you said about the patty melt. I’ve had it quite often. The owners, Anton and Susan, are delightful people and have operated Roady’s for close to 20 years. I am proud to say that I introduced them to the opportunity of taking it over when they were forced to leave their former location at the bowling alley at Foothill and Garey in Pomona (many of your readers will remember what an excellent coffee shop that location was and which, prior to their operating it, was run for many, many years by Mr. Chapman). Getting back to Roady’s, it has had several operators over the years. It dates back to the 1930s. I have heard that it began as a soda fountain a few doors down to the east, but the present location dates back many decades. It has been used now and then as a film-shoot location and in the ’90s was used as a location for a short-lived television series starring Ann-Margret (I don’t remember the name of the show). And yes, as you mentioned, there was a very destructive fire in the ’90s and it was build back exactly as it had been. Although we now reside in Pomona and before that for many years in Claremont, Judy and I feel very much a part of San Dimas because of all those years we operated the Canyon Theatre at Bonita and San Dimas Canyon Road. We did many promotional tie-ins with Roady’s, especially during the years of our Classic Film Series on Thursdays. We would have drawings for prizes and we gave away many Roady’s meals. On Thanksgiving Day each year we would set up a banquet table up in the projection room (movie theatres are open every day of the year) and Anton from Roady’s would supply us a wonderful traditional Thanksgiving dinner for Judy and I and the theatre staff. Yes, Roady’s is a special place, as a San Dimas institution and as a special place in Southern California. The quality of the food and the low prices are just unbelievable in today’s world. A few years ago, the Los Angeles Times gave them an excellent write-up on their chicken fried steak, encouraging people to make the trip to San Dimas. I’m glad to see you’re out there, always stretching the envelope to find good pie! While Mr. Tanner’s definition is pretty close, I think you have to add an exception to his rules. 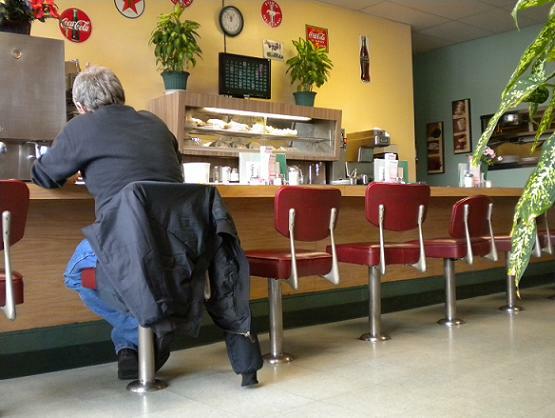 Can any diner operate without the most basic of staples — tuna fish? And yet, by definition, that would qualify as “unfried seafood” and require it to be omitted from the menu. David, how can you abandon your longtime, Midwestern love affair with the tuna melt? Dave, the CBS series that had Ann Margret behind the counter at Roady’s was “Four Corners,” w/San Dimas doubling for Utah.